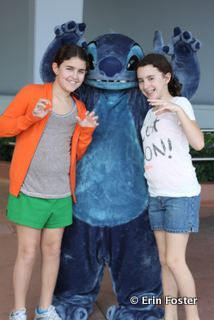 On this page you'll find Disney character meet and greet tips and answers to our reader's frequently asked questions. While the rides at Walt Disney World get all the buzz, very often it’s meeting Buzz, or some other Disney character, that becomes the highlight of a child’s vacation. Here’s the scoop on what you need to know about meeting characters at Walt Disney World. Characters are often much larger than children. What is exactly is a character? Characters are the live version of animated creatures/people found in Disney films and television programs. Characters appear in the Walt Disney World parks and resorts in parades, stage shows, and in guest greeting opportunities. 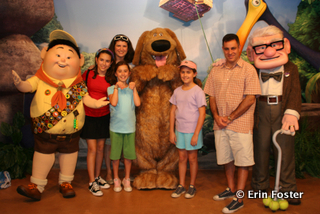 While a character may be just inches tall when you see him on TV, all the in-park characters are adult human size or larger (sometimes much larger). There are two types of characters: fur characters and face characters. Fur characters are those with an oversized, non-moving mask serving as their entire head. Typically the fur characters are animals such as Mickey and Minnie, Goofy, Donald, and Pooh. There are a few “human” fur characters, notably Captain Hook and the Incredibles, but these are less common. Face characters have a fully human form – they look like real people. The essence of the character is conveyed via costuming, wigs, and makeup. Face characters include all of the princesses, Peter Pan, Jack Sparrow, Mary Poppins and more. Other than appearance, one of the key differences between face characters and fur characters is that face characters talk, while fur characters generally do not. How can I explain to my children why the fur characters do not talk? Check out our full post on the topic of non-talking Disney characters. How many characters does Disney have? There’s no exact count of the number of characters that have appeared in the Disney World parks. Over the years, something on the order of several hundred different characters have visited Walt Disney World. On a typical day now, you’ll usually find a few dozen different characters in the parks. Do you have a list of the characters I might be able to meet in the parks during my trip? The characters that greet guests in the parks change with some regularity and there is no official Disney-sanctioned list of in-park characters. There are a number of unofficial/amateur/fan websites that track character appearances in the parks. Of particular note is charactercentral.net. Are there other characters too? 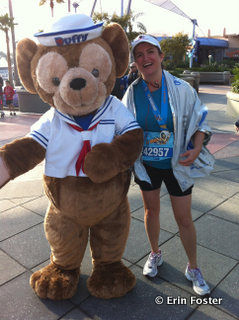 During runDisney events. For example, during the Princess Half Marathon you can expect to find hunky heroes such as Tarzan or Hercules that don’t typically appear in the parks at other times. 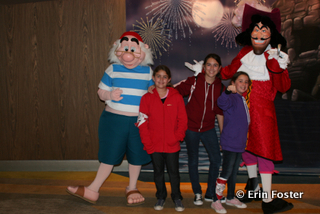 During the 2013 Limited Time Magic promotion, there have been “Long Lost Friends” weeks where infrequently appearing characters have made brief visits to the parks. During Mickey’s Not So Scary Halloween Party, you may find extra villains in the parks. During spring Star Wars Weekends at Disney’s Hollywood Studios, you’ll find Darth Vader, Stormtroopers, Chewbacca, and many other related characters in attendance. 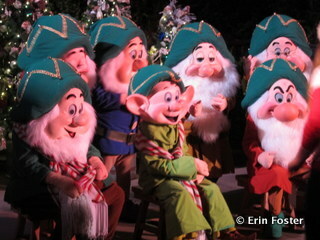 During holidays, you may find seasonally appropriate or non-Disney characters in the parks. Examples include Santa at Christmas and Mr. & Mrs. Bunny at Easter. Also, there are many characters that appear in the parks only as part of parades or stage shows, but do not typically participate in guest greeting opportunities. An example of this would be Winnie the Pooh’s friend Rabbit. You’ll find Rabbit on a float during the Mickey’s Not So Scary Halloween Party parade, but probably not anywhere else. And you may just find random characters appearing in the parks. I’ve recently gotten spur-of-the-moment photos with Pinocchio & Gepetto and the Country Bears at the Magic Kingdom and with Jiminy Cricket and Thumper at the Animal Kingdom. I’m at Walt Disney World. How do I find out which characters I can meet right now? When you enter the Disney parks, grab a copy of the free Times Guide. These will be located with the maps at the front of the park, as well as at the registers of some of the larger stores on property. 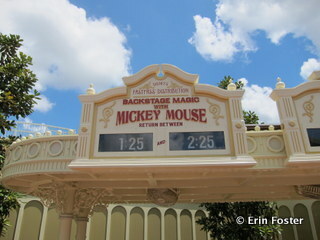 The Times Guide will list all the characters that are regularly scheduled to be in the park each day, as well as the time and location of their appearance. Some of the information on the Times Guide will be somewhat vague. For example, the Magic Kingdom Times Guide might say something like “Out of this World Friends” will be in Tomorrowland. This might mean alien Stitch or out-of-this-world space traveler Buzz Lightyear, or it might mean Chip & Dale wearing futuristic spacesuits. If you have questions/concerns, stop by the guest relations office at the park to inquire. Is there only one place to meet each character? It depends on the character. Some are location specific, for example Tinker Bell is generally only found in one spot, but Mickey Mouse has a number of regularly scheduled greeting locations. These include: Chef Mickey’s at the Contemporary resort, the Adventurer’s Outpost at the Animal Kingdom, Tusker House at the Animal Kingdom, the Character Spot at Epcot, the Garden Grill dinner at Epcot, Mickey’s Backyard BBQ at Fort Wilderness, the Town Square Theater in the Magic Kingdom, the ‘Ohana breakfast at the Polynesian resort, and others. How does Mickey get to be in all those different places at once? Will character XYZ from Disney’s latest theatrical release be available to meet my family? Probably. In recent years, Disney has had the practice of having characters from the latest Disney or Pixar film in the parks to greet guests. Typically the characters from the newest film will appear in the Magic of Disney Animation pavilion at Disney’s Hollywood Studios. The exception to this is when there is a new princess character. New princesses typically appear first at either Epcot or the Magic Kingdom and then end up at the Magic Kingdom on a long-term basis. Is meeting characters worth the time? Wouldn’t we be better off going on rides? Oh, those “Is it worth it?” questions are such a challenge. The answer to this really depends on your personality and what your vacation goals are. Some people think that meeting a character is just plain silly (I mean, we all know what’s really going on inside Mickey’s head, right?). Other folks are obsessed with character greeting and endeavor to collect photos and autographs of every character possible. In my experience, children in the 3 to 6 age range often think that the in-park characters are really, really, really real. If they LOVE Belle and then, gasp, they get to actually MEET Belle, then their entire vacation is a dream come true. 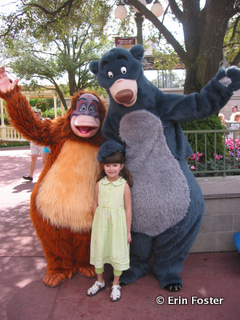 Your basic five-year old may care much more about meeting characters than they would about any ride attraction. My daughters are teens now. When we go to the Animal Kingdom these days, we head straight for Expedition Everest, but back when the girls were preschoolers, our very first stop at the Animal Kingdom was always the character greeting zone at Camp Mickey-Minnie (now moved to the Adventurers Outpost). My kids were THRILLED to get quality character time there and this made our vacations very happy. Even if you’re generally a character naysayer, I do recommend that you take at least one or two photos with iconic characters during your visit, if only for the camp factor. You never know how these photos will become meaningful to family members in the future. How exactly do I meet the characters? Scheduled character greeting appearances. These are the character appearances listed in the Times Guide. Go to the appointed time/place and you’ll find the character there ready to interact with guests. Random character greeting appearances. There are also characters that just show up in the parks. They’ll also be happy to interact with you, but there’s really no predicting when they will be there or for how long. These are restaurants where Disney characters will visit your table during your meal. While you eat, characters stop by your table to chat (or mime chat), pose for photos, and sign autographs. These are very popular experiences and generally become fully booked far in advance. Make reservations if you want to have a character meal. What are the pros and cons of character meals? On the plus side, you get to meet characters in air-conditioned comfort and you get to kill two birds with one stone – eating and meeting at the same time. On the minus side, the character meals are often pricey. If you’re in money saving mode, you can meet characters for free in other locations. What else can you tell me about character meals? Character dining is an in-depth topic all on its own. You can learn the complete scoop about character dining over on DisneyFoodBlog.com. Look here for tips on how to choose the right character meal for your family and for ideas about how to get the most out of your character dining experience. Is there character greeting etiquette? When it gets to be your turn in line, be ready and as efficient with your interaction as possible. This means that you should have your camera out (turned on, with the lens cap off), have your autograph book open to a blank page, have pen in hand, etc. Be mindful of other guests’ needs. Yes, we’d all like to spend an hour yakking with Cinderella about the difficulty of polishing glass slippers, but if we did that then other guests would not have their opportunity to enjoy Cindy’s company. You don’t need to rush with the characters, but you shouldn’t linger unnecessarily either. Keep an eye on your children. Make sure that small kids don’t inadvertently rush at the characters, knocking them over. Also try to keep them from bounding into another guest’s photos. Use your manners. Yes, characters are people too. Saying please and thank you to them will make their world a better place to be. Do the characters have different outfits? Of course, don’t you? Mickey has dozens of of different outfits ranging from swim trunks to a tuxedo. You’ll find the characters often wear attire appropriate for their location. Donald Duck sports a sombrero when he’s in Epcot’s Mexico and a pith helmet when he’s in the Animal Kingdom’s Africa. Some people will “count” that they met Donald if they snag any photo with him, while other guests will only be satisfied if they acquire photos with every sartorial variation. It’s your call. Are there characters in the Disney hotels? At character meals taking place at resort restaurants. In order to meet a character here, you’ll need to be dining at the restaurant. During the holiday season, there may be brief character appearances in the evenings at the deluxe resorts. If you’re visiting Walt Disney World from about December 15 to January 1, speak with your resort concierge about whether this will be happening. 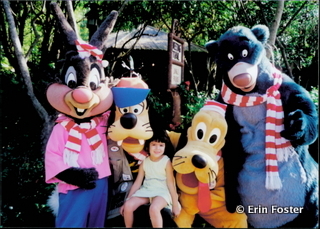 During times of extraordinary weather (like if the parks are shuttered due to hurricane warnings), characters may be sent to the resorts to entertain guests. Are there character appearances at Downtown Disney? Only rarely. There might possibly be a character appearance at Downtown Disney during a special event such as the Festival of the Masters. And Santa Claus has regular Downtown Disney greeting hours during December, but other than that, do not expect to see characters at Downtown Disney. My child absolutely MUST meet character XYZ, how do I make sure that happens? I completely understand. Sometimes a child becomes fixated on meeting that special someone and it then becomes your raison d’etre to make that meeting happen. First things first – do NOT make any promises to your child about the meeting. Even if your child’s character fixation is on someone as ubiquitous as Mickey, you just never know what might happen. Your child may become ill, forcing you to cancel your Chef Mickey’s reservation; Mickey himself may become ill; there could be a technical malfunction at a greeting spot forcing an unplanned closure – really, you never know. Instead use language like, “Mommy is going to try to have you meet Mickey,” or “I hope we’ll have a chance to see Mickey.” Then you can be a hero when the meeting works out. Also recognize that if your child is focused on an older or obscure Disney character, a meeting will likely be impossible. Yes, Esmeralda from The Hunchback of Notre Dame was once a frequent visitor to the parks, but her appearances now are rare indeed. Given that, the best way to approach any MUST DO character meeting is to get information from the Character Hotline. This is a resource available to cast members that includes a database of where/when every character is appearing on property that day. If a character will be at Walt Disney World, the Character Hotline will know about it. To get access to this information, stop by the Guest Relations office at any of the theme parks or inquire at the concierge desk at your Disney resort hotel. Say something like, “My daughter is dying to meet character XYZ. Can you please call the Character Hotline to find out if XYZ will be greeting guests at Walt Disney World this week.” They’ll be happy to help. You may also want to work on language for your child if you find that his character obsession can be found in the parks, but only in a parade or show, not in a greeting location. Are the lines for character greeting long? They can be. It really depends on a number of factors including the time of day, the time of year, the rarity of the character, the popularity of the character, the weather, and more. If you have a particular character you’d like to meet and you know that character has a regularly scheduled greeting time GET THERE EARLY. Do you have any tips for reducing the amount of time spent waiting to meet characters? Well, a good touring plan can certainly help. 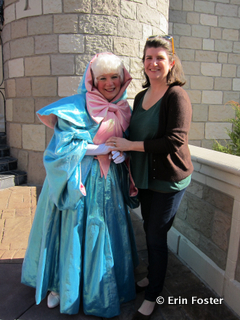 Many of our touring plans do include character greeting time in their programs. A few of the characters have FASTPASS opportunities. As the new FastPass+ system becomes implemented, we may see that many more characters have FASTPASS availability. But really, as with all things Disney, if you want to do/see something without a wait, then get there early enough to be the first one in line. Is there some way to find out in advance of my vacation what time the scheduled character greetings will happen? The independent website Walt Disney World Entertainment, posts the scheduled character greeting times/locations about a week in advance. Bear in mind that this is not an official Disney source and that the information is subject to change, but generally it is quite accurate. This site does not track spontaneous character greeting appearances. Will my child be afraid of the characters? It really depends on your child’s temperament. Most kids are unfazed by meeting Mickey and the gang, while others are reduced to a quivering ball of tears any time they get within 10 feet of a giant mouse. If you have some concern that your child might exhibit character fear behaviors, try finding a costumed character in your hometown (perhaps at a birthday party or Chuck E. Cheese type venue) to practice with. At least with the information, you’ll be able plan accordingly. I know my child is afraid of the characters. Should I cancel my trip? I wouldn’t worry too much. At no point will a character pop out of nowhere to surprise your child. The characters tend to stay in a fixed location and are visible from quite a distance. They’re relatively easy to steer clear of if you really want to. Is there anything I can do if my child is afraid of the characters? Like I said, if you know you have a fearful child, you can simply stay away from the characters. Just like you wouldn’t (or shouldn’t) insist your child to go on a roller coaster before he was ready, you can always take a pass this time and save character photos for the next trip. If you want to push the envelope a little, try taking baby steps toward character interaction. Perhaps ask the child to wave at the character from a distance, or stick with the somewhat less intimidating face characters rather than fur characters. You mentioned autographs, what’s that all about? You will see lots of kids in the parks toting around autograph books. When the kids meet characters, they hand them the autograph book and the character signs it. Personally, I don’t really get why this is a thing (then again, I don’t really understand the appeal of getting autographs from actual human celebrities), but it does seem to be a big deal to many Disney guests. Of course, you don’t have to get autographs when you meet characters. If you and your kids are content to skip this part of the process, then by all means do so. One bit of advice … if you do end up collecting character autographs, but sure to write your name and contact information in the front of the book. This will greatly facilitate the return process if you accidentally lose the book. Do I need a special pen to get an autograph from a character? The characters are often wearing bulky gloves which make gripping a delicate writing tool a bit of a challenge. It can be helpful if you provide them with a somewhat chunky pen, maybe something along the lines of the basic elementary school Crayola marker. However, if you don’t have a fat pen, don’t worry about it. The characters will make do with whatever you have on hand – regular pen, pencil, crayon, – it all works. You should know that there are a few characters who are happy to meet you and pose for photos, but can’t or won’t sign autographs. King Louie (from the Jungle Book) has difficult to control arms and simply doesn’t sign. Some characters, notably Buzz Lightyear, will mark your autograph book with a special stamp rather than a signature. Not surprisingly, Lightning and Mater are in the non-autograph-signers club. How much do autograph books cost? Where can I buy them? There are several styles of Disney autograph books for sale in the parks and resorts. They range in price from about $7.00 to about $12.00 depending on the model you choose. It’s actually a challenge to find a store at Walt Disney World that doesn’t sell autograph books. You’ll find them located near the register at nearly every store on property. Several versions of Disney autograph books are also sold on DisneyStore.com. That being said, there is absolutely no requirement that you use a Disney branded autograph book when you get signatures. A $.99 notebook from Staples works just as well. Do I have to get autographs in an autograph book? Nope. The characters will sign almost anything. I’ve heard of guests asking characters to sign calendars, photo mattes, postcards, baseball caps, footballs, quilt squares, Vinylmations, and much more. You should know that characters will not sign any clothing while you are wearing it. This means that they’re happy to sign a tee shirt, but not one that you’re wearing at the time. Nor will they sign any part of a human body. Don’t even ask. If you will be asking characters to sign something non-traditional, be sure to give them a mechanism so they can do this easily. For example, if you want a character to sign a tee shirt, bring a clipboard or piece of sturdy cardboard to provide a backing surface for them to lean on. Also, if you’re having characters sign fabric, you will want to consider whether you need to bring indelible fabric markers or the like. I’ve noticed that characters sometimes take a break during the middle of their scheduled greeting time. What’s up with that? Well, even Mickey needs a potty break from time to time. Seriously, there will almost always be a “character handler” cast member nearby when characters are out and about; the character handler can tell you exactly what’s going on. Look for semi-official looking people with blue shirts and walkie-talkies or headsets. They’ll be able to tell you if Mickey is just “getting a snack” for a moment or if he’s taking a much longer break to go appear in a parade. Be aware that characters appearing outdoors on hot days will take much more frequent breaks than those hanging out in air-conditioned digs. 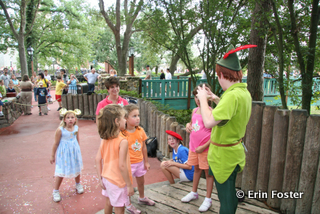 Are there PhotoPass photographers at the character greeting stations? Some, but by no means all, character greetings have a nearby PhotoPass photographer to capture your memories. You should ALWAYS plan to have your own camera available to take shots yourself. If you want to have a full family photo and there’s no PhotoPass photographer at the ready, feel free to ask a nearby guest or ANY cast member to take a photo with your camera. They are totally used to doing this and are happy to help. Over the years I’ve asked everyone from groundskeepers to vice presidents to take photos of my family in the parks. They’ve all been eager to do so. Do you have any tips for getting a good photo with a character? Watch the position of the sun. If you’re kids are looking straight at the sun, they will close their eyes and make weird squinty faces – not attractive. Perhaps you can ask the character to pivot a bit for less glare. Or maybe save character photography (or any human photography) for times other than mid-day. Kill the flash. Your flash will wash out your subject. Figure out your camera settings and learn how to take a decent indoor picture without using the flash. It matters what you wear. 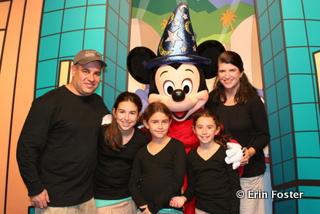 I’m not saying that you need to don a ball gown for your family Disney vacation (well, unless you’re in princess dress mode), but having your family wear simple coordinating outfits can bring your pictures from OK to WOW in an instant. Take a quick glance at the background of your shot. Is there a tree behind little Katie that makes her look like she has horns? Is there another guest’s tushie in your photo? Can this be fixed quickly to make your overall photo more attractive? Can I take more than one photo with a character? Sure, but try to be as efficient as possible. Will the characters hold my child for a photo? Well, let’s put it this way, imagine big-headed Mickey holding an infant and accidentally dropping her. Or imagine Mickey holding a toddler who’s sporting an unknown leaky diaper. Or imagine a Mickey picking up a preschooler who’s got a belly full of cotton candy and is woozy from a few consecutive spins on the teacups. Or imagine any other of a thousand unpleasant scenarios that might occur if characters held children. The characters are happy to pose with your young child if you’re holding her, or if she’s sitting in a stroller, but nothing beyond that. Will the characters hold up a sign/message for a photo? It depends on what the sign says. A nice way to communicate with the folks back home is to send them a photo of a character holding a special message for them – something along the lines of “Happy Birthday, Susie,” or “We Miss You Grandma, Wish You Were Here,” or “Thank You For Housesitting” works nicely. Most of the characters will do this, but they’re required to read the sign first and will only hold it if the message on the sign is positive and solidly G-Rated. Can I take video of my child with a character? Sure. But please be aware of the other guests and their desire for character interaction. A few seconds of video is fine, enough footage for an hour-long documentary is not. Are there age limits for meeting characters? No way. ANYONE can pose for photos with characters. It’s not just for kids. You mean it’s not weird if I’m a grown-up and I give Mickey Mouse a hug? This is not even a little bit weird at all. Truly. In fact, I absolutely insist that every grown-up get at least one photo with Mickey without a child in the frame. This goes double if you’re at Walt Disney World for any sort of adult celebration such as a honeymoon or anniversary. Is there anything I can do to increase the quality of my interaction with a character? If the characters are super busy, you might not be able to get more than a quick hug or hello. But there are many times when you can get a more substantial or personal interaction with a character. The trick to get characters to engage with you, is to give them an opening or hook they can latch on to. This is perhaps easiest with the “face” characters, the ones that will talk with you. For example, ask the character a question relevant to their movie storyline – something like, “Cinderella, what size shoe do you wear?” or “Belle, what’s your favorite book?” or “Jasmine, what’s it really like to fly on a magic carpet?” They will often give you charming and very elaborate answers. With the non-speaking “fur” characters, a prop is often helpful in getting a more substantial character experience. For example, if you’re meeting Donald Duck, bring a toy Mickey Mouse with you and see how Donald reacts. Or engage the character in a contest or mime-able story – challenge Tigger to a jumping contest or tease Chip & Dale that you can’t tell them apart. One of my personal favorite character interaction stories happened this past Christmas, which we celebrated at Walt Disney World. I had gotten my daughters all novelty knit caps which said, “I Need a Vacation.” It was quite chilly in the parks and they ended up wearing them to Epcot. 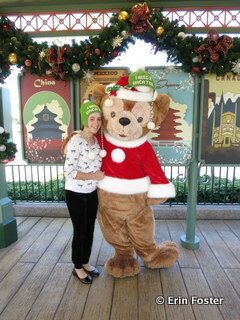 During a meeting interaction with Duffy (my youngest daughter’s favorite), Duffy became quite taken with the hats. You could tell that Duffy himself was reeeeeally ready for a vacation himself. He insisted on putting on one of the hats and posing for photos in it. This bit was simultaneously funny and ironic, as well as completely personal for our family. Is it possible to get a photo of my child with more than one character at a time? Sometimes, but not often. 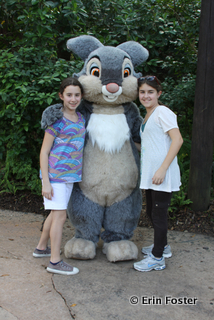 There are some characters that tend to make their guest appearances in pairs, Chip & Dale are a prime example of this. 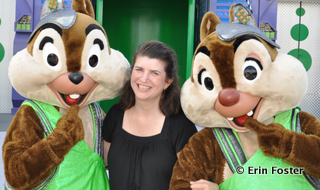 It’s relatively easy to get a photo with the chipmunks together. Lilo and Stitch are also somewhat easy to find as a set. But most other characters only greet alone. You MIGHT get lucky and find a situation where more than one character is available without a line. If this happens, you can certainly ask if they’ll pose together, but don’t count on this happening. Are character greetings ever impacted by the weather? Yes. Any outdoor character greeting will be either cancelled or moved during rain and possibly even during extreme heat or cold. If the weather is questionable and you can’t find a character in his or her expected greeting area, ask a cast member to check whether the meet has been temporarily relocated. Is it possible to have a character at a private event at Walt Disney World? Yes. You can get Mickey (or almost any other character) to appear at your wedding reception or other private event. Be aware that this level of character interaction does not come cheap. Speak with your Disney event planner for details and pricing. Can Mickey Mouse (or another character) give my child his birthday present? Maybe, but this would really be a spur of the moment thing handled on a case by case basis. Disney doesn’t want to get into a situation where Mickey is handing Child A a pretty package and then handing nothing to Child B. If you happen to have a small gift for your child and there is a character present, and few other guests around, then go ahead and ask the character handler if you can work something out. I’ve heard of this happening infrequently, but don’t count on this being a possibility. Can I arrange for Mickey (or another character) to help me with a proposal? Mickey is a busy mouse so this kind of thing can be a challenge to work into his schedule. Unless you're willing to pay to book Mickey for a private event, you shouldn’t count on his help with your proposal. I have, however, heard stories about this happening in an impromptu fashion. If it’s something you're interested in, pull a character handler aside and ask his or her advice. Are there people other than characters that I should be getting a photo with? Sure, there are loads of “characters” in the parks that aren’t characters. 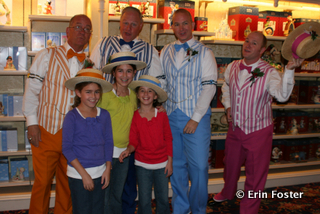 I’m thinking of performers like the Dapper Dans in the Magic Kingdom, any of the entertainers in Epcot’s World Showcase area, the Streetmosphere folks in Disney’s Hollywood Studios, or PUSH the talking trashcan. To me, these folks symbolize Disney as much as many of the traditional characters.